Boulevard Park is a community of about 5,000 residents in southern Seattle. Though it is its own area of unincorporated King County, it is sometimes referred to as Riverton-Boulevard Park with its neighbor, Riverton. Homes for sale in Boulevard Park were mostly built in the 1950-1970's. It is surrounded by the communities of White Center, South Park, Burien, SeaTac, and Tukwila. Two of the borders are highways are 509 and 599, both of which run parallel to I-5; average commutes in Boulevard Park are about 30 minutes. 4 Beds | 2.75 Baths | 2720 sq. Ft.
4 Beds | 2.75 Baths | 2250 sq. Ft.
5 Beds | 2.5 Baths | 2730 sq. Ft.
5 Beds | 2.5 Baths | 2315 sq. Ft.
6 Beds | 3 Baths | 2370 sq. Ft.
5 Beds | 2.75 Baths | 2400 sq. Ft.
Blue Summit Realty has the most accurate and up to date Boulevard Park real estate listings on the web. Currently there are 9 homes for sale, and 4 vacant land properties in Boulevard Park. Of the 13 total Boulevard Park residential listings for sale 0 are bank owned, 0 are short sales, 0 are new construction, and 0 are townhomes. The price ranges from $305,000 to $0 with a median list price of $500,645 and median sold price of $452,082. Make sure to refine your Boulevard Park real estate search by property type, price, square footage, bedrooms, bathrooms and more with the search tool above or view the Boulevard Park listings on our interactive map. 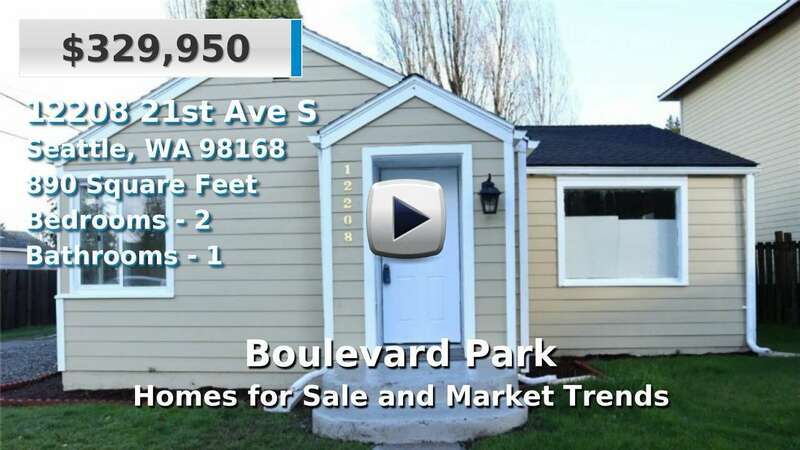 Our Boulevard Park real estate listings were updated 10 minutes ago.